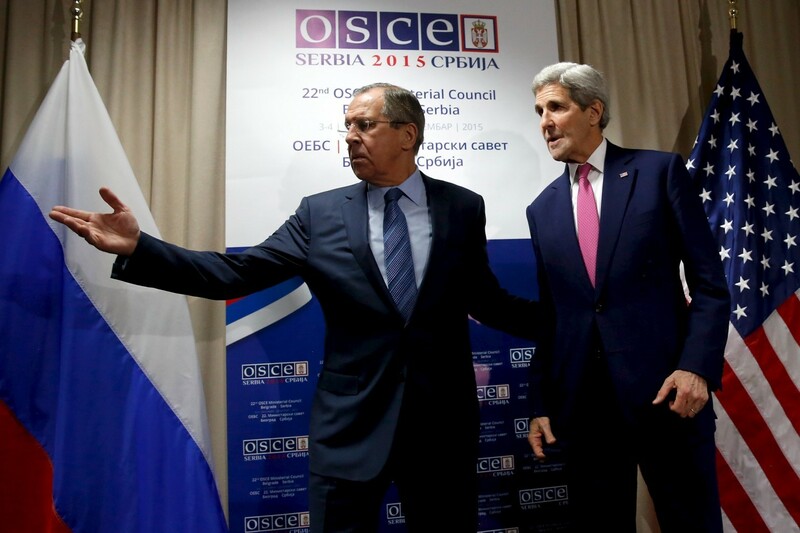 BELGRADE, Serbia -- Secretary of State John F. Kerry called on Russia Thursday to withdraw its troops and equipment from eastern Ukraine so a peace deal can take effect by the end of the year. Russian Foreign Minister Sergei Lavrov invites Secretary of State John Kerry to a sitting area as he arrives for their bilateral meeting alongside the OSCE Ministerial Council meeting in Belgrade. “This is the time for concrete steps to end this disastrous and unnecessary conflict, and begin the process of rebuilding in Ukraine’s east,” Kerry said in remarks at a meeting of the Organization for Security and Cooperation in Europe, which has the often-dangerous task of monitoring the situation on the ground in Ukraine. A pall of sadness hung over the group’s annual meeting, as diplomats in turn offered condolences to other nations for citizens killed in terrorist attacks and other acts of violence. Russian Foreign Minister Sergei Lavrov was among several foreign ministers who gave their sympathies for the 14 Americans killed in San Bernardino on Wednesday and the 130 people who died in Paris three weeks ago. Kerry expressed sorrow for the dead and wounded in California, and the loss of 224 people aboard a Russian commercial airliner shot down over the Egyptian Sinai by a group affiliated with Islamic State. The war against the Islamic State, also known by the acroynm ISIL and Arabic name Da’esh, was an ever-present motif as the diplomats attended a series of meetings at a large convention center. Kerry said the militants who have established a caliphate in parts of Syria and Iraq cannot be defeated by airstrikes alone. “Without the ability to find some ground forces prepared to take on Da’esh this will not be won completely from the air, and we know that,” said Kerry, who told reporters he was not speaking about Western forces but Syrian and other Arab troops. Kerry also urged support for the multinational effort to start negotiations between the government in Damascus and opposition groups, and establish some sort of political transition that would usher President Bashar al-Assad from power. That in turn, he said, would open the door for a unified front to confront Islamic State. “If we can get a political transition in place, we empower everybody,” he said. But the ongoing conflict in nearby Ukraine was an immediate occupation for many of the diplomats in Belgrade. Both the Ukrainian government in Kiev and separatist rebels have complained that after a period of relative calm, heavy artillery is being used in violation of a cease-fire negotiated in the Belarus capital of Minsk. Kerry specifically called for the Russian withdrawal, free access for OSCE monitors, the holding of elections, the return of Ukrainian control over its border with Russia and the release of all hostages and prisoners. Kerry was repeating an assertion he has made many times before. What was striking was the venue and the timing. By saying it again before the OSCE and their top diplomats, he made clear that the Ukraine conflict would be high on the agenda when he met with Lavrov shortly afterward. The West has dangled the prospect of easing economic sanctions against Russia if it helps implement the peace deal negotiated in Minsk last February by the leaders of France, Germany, Russia and Ukraine. It expires on Dec. 31, and U.S. officials say there is little chance the deadline will be met. The United States says Russia continues to provide separatists with arms and troops in what’s known as the Donetsk Basin region, which in turn ensures the fighting continues sporadically. Moscow denies the charge, though both Kiev and Washington have released photographs suggesting otherwise. The West said sanctions against Russia, in effect since it annexed Crimea in 2014 and further strengthened since then, can be eased if Russia takes steps that allow the Minsk agreement to take effect. “If Moscow wants relief from sanctions ... it is there for the getting,” Kerry said Wednesday at NATO headquarters in Brussels. Another backdrop to the meeting is rising tensions between Russia and Turkey, which have been steadily spiraling downward since Turkey shot down a Russian military jet along the Syrian border. Moscow has accused Ankara of complicity in oil sales by Islamic State smugglers. The anger ratcheted up another notch Thursday, when Russian President Vladimir Putin would never forget what Turkey did, and Turkey would come to regret it. “If anyone thinks Russia's reaction will be limited to trade sanctions, they are deeply mistaken,” he said. The United States and other NATO countries are supporting Turkey, but are encouraging Moscow and Ankara to iron out their differences.